Twenty participating teams, twenty six hours given, and a case company which is in an industry that accounts for approximately twenty percent of Hong Kong�s economy. 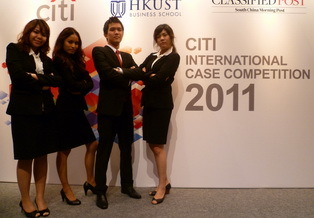 These are some of the challenges faced at Citi International Case Competition 2011, co-organized by Citi Group and the Hong Kong University of Science and Technology. The Thammasat Team, comprised of Miss Paweennuch Klaykaew (Opener/Closer), Miss Veeranan Pipatwongkasem (Analyst), Mr. Tadcha Anunrojwong (Finance), and myself Monsinee Sattayarak (Strategist), were able to bring home the champion trophy! Personally, one of the reasons we won matches this quotation by Dale Carnegie �People rarely succeed unless they have fun in what they are doing.� Amidst the intense working hours, laughter could be heard from the Thammasat room! This success cannot be achieved without the following people whom we would like to express our sincere appreciation: Ajarn James Fitzpatrick, thank you for your continuous support and guidance. This is the experience that four of us will always treasure. Ajarn Supawat Likittanawong, thank you for your support and a wonderful time in Hong Kong. P�Pam, thank you for facilitating with everything. 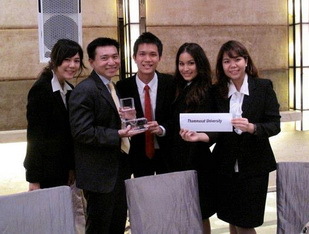 Lastly, thank you BBA Thammasat Program for supporting this case competition activity. Posted date: November 29, 2011 � 09:00 hrs.